I've tried calling MagickRemoveImageProfile after MagickProfileImage, but it simply removed ICC profile and output file is color exact to input. Do I need to add sRGB profile first to image, and then do conversion ? If so, what MagickWand method has to be called ? What you ask for doesn't seem to make logical sense. If your input image has no embedded profile, and you have an ICC file, how will "image colors should be "translated" with input ICC profile"? Translated from what? To what? ICC profiles can be "assigned" and "converted". Assignment changes metadata without changing pixel values, declaring what colours should be shown with those values. 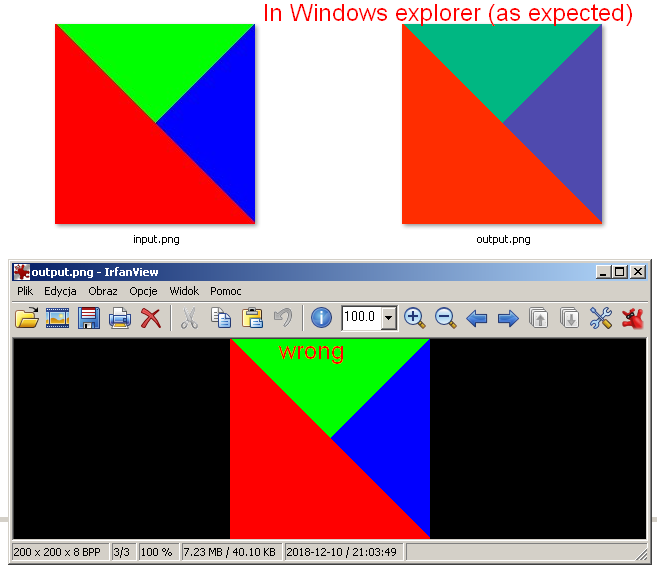 Conversion from one profile to another changes metadata and pixel values without changing colours (except for limitations imposed by the profile). Profiles can be removed from images, of course, which changes metadata only. But if you merely assign then remove, nothing changes. Perhaps you want to assign one profile, then convert to another profile, then remove that profile. That's no problem, but it needs two profiles. It would help if you provide the input image by itself. Where msProfileRGB is a sRGB profile file.